Taking a break from my canvas painting this week to print my linocards. How are you spending your first weeks of the new year? Now accepting orders for my limited edition hand pulled original linoprints. Today, the second shipment orders were dispatched and tomorrow I continue to be busy printing, signing and shipping the next order. Please don't wait too long to get yours as they are moving out fast. Thanks so much everyone! About the cards: they are printed on high quality linodruckpapier, 120g/qm, each hand printed, numbered, signed and professionally mounted on 14x19cm 130g/m2 soft ridged card with matching envelope andprotected in an individual clear plastic sleeve. Each card is a hand pulled original print, using high quality Schminke Linoprint color and is limited to 300/300 - A/P2 - HC3. FACT: Did you know that the last time in the Chinese Calendar the combination of the element FIRE and the animal ROOSTER was in 1957? It is a fact that, such combinations reoccur only every 60 years! This is because there are 12 animals in the Chinese calendar counting system: Rat, Cow, Tiger, Rabbit, Dragon, Snake, Horse, Sheep, Monkey, Rooster, Dog, Pig. To make the 60 unique color animal names, the Chinese have also added the Five Elements: Metal, Water, Wood, Fire and Earth and these Five Elements are connected to colors: White, Black, Green, Red and Brown. Hence, this is why each Chinese year has a color animal name. Because Red is connected to Fire, 2017 is also called the Red Rooster Year (some Chinese Stem system say that 2017 is a female year so actually 2017 is probably the year of the red chicken year for the strict astrologers). The Chinese new year will begin on January 28, 2017 - February 15, 2018 to be followed by the Brown Earth Dog Year next. Drop me a line (info@tamikobraun.com) if you'd like to have your own collectibles or cards for gift-giving and don't forget to take advantage of the 10% discount promotional campaign TAMIKO-2017 by subscribing to my newsletter! Lucy Monkey goes Banking ! YES! 👍🎉 A German bank called me last week after seeing my Fine Art 2016 New Year Linoprints and gave me a special order. 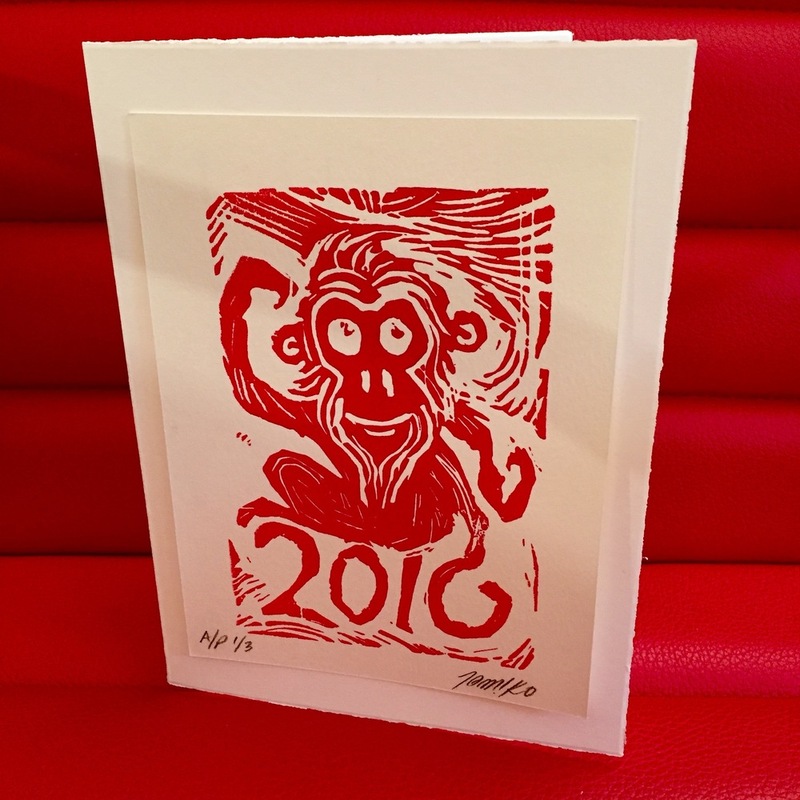 How exciting to think that their clients will soon be greeted by my Lucky Monkey! All packed up and getting ready to ship! — feeling proud in Munich, Germany.